ThinkGeek offers a number of fake products for April Fool's Day each year. 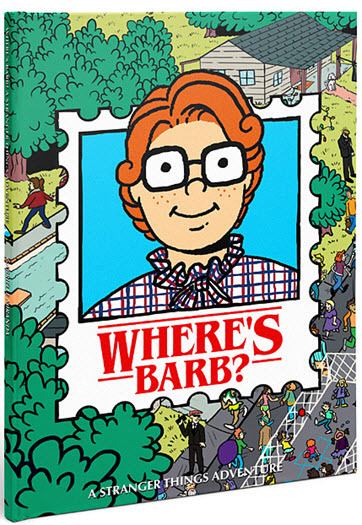 This year one of the items is a book called Where's Barb?. The Where's Waldo inspired book features Barb from Netflix's popular Stranger Things series. Barb is Barbara Holland in Stranger Things. She's Nancy Wheeler's best friend who goes missing in season one. ThinkGeek says you have to find Barb in the puzzles in the book before the monster gets her. The nerdy Barb does have a resemblance to Waldo. ThinkGeek says, "It seems only right that a series which so effectively evoked the atmosphere of the 80s, Netflix's Stranger Things, would team up with the creators of Where's Waldo to produce this crossover, Where's Barb? Search the little town of Hawkins for Barbara Holland. Maybe she's studying with Nancy. Wait. Why's her car a couple of blocks from Steve's house? The police are pretty sure she just ran away. But is that her Trapper Keeper peeking out from under that bush? We promise searching for Barb will be hours of fun for the whole family!" In the past ThinkGeek has turned some of its April Fool's products into real products. Maybe they will do this with Where's Barb? Some of the other fun new items this year include a mailbox that resembles Thor's hammer, a flaming basketball hoop, a onesie with a built-in bean bag and a Banksy toaster.